Chinese President Xi Jinping will pay state visits to Spain and Portugal, respectively scheduled for Nov. 27 to 29, and for Dec. 4 to 5. His state visit to Spain will be the first visit in 13 years for a Chinese head of state, and that to Portugal the first in 8 years. It is expected that Xi’s trip will strongly promote the alignment of China’s development strategy and that of the two countries’, deepen cooperation under the framework of the Belt and Road, and inject new impetus into China-Europe relations in the new era. The two countries on the Iberian Peninsula are endowed with rich natural, historical and cultural resources. China enjoys long-standing friendly exchanges with the two countries and has established comprehensive strategic partnerships with both of them. The year 2018 marks the 5th anniversary of the proposal of the Belt and Road Initiative. Spain and Portugal, both at the intersection of the Silk Road Economic Belt and the 21st Century Maritime Silk Road, are important stops on Xi’s trip which mainly focuses on co-construction of the Belt and Road. According to Spanish media reports, President Xi’s visit to Spain is highly anticipated by the Spanish entrepreneurs, who hope to gain more opportunities to take part in the joint building of the Belt and Road. The Yiwu-Madrid freight route (Yiwu-Xinjiang-Europe) has greatly boosted trade between China and Spain since its opening at the end of 2014. 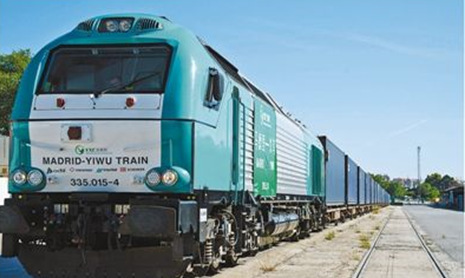 Over the past 4 years, Spanish exports to Yiwu have increased by more than 300 percent, thanks to the cargo train service. In 2017 alone, Zhejiang imported $ 578 million worth of goods from Spain, an increase of 49.9 percent year on year. Spanish products, including ham, wine, olive oil, auto parts and medical facilities are available in the Chinese market because of the freight trains. Portugal is an important participant of the first Belt and Road Forum for International Cooperation, and it is also one of the founders of the Asian Infrastructure Investment Bank(AIIB). “I love China very much,” said Portuguese President Marcelo Rebelo, adding that his country had always been a firm supporter of joint construction of the Belt and Road right after it was proposed by President Xi. Portugal, having the best natural port resources in Europe, is willing to strengthen its cooperation with China and jointly push ahead with Belt and Road construction. The implementation of the Belt and Road is expected to put new forces into boosting regional and global economic growth against the backdrop of anti-globalization and the sluggish recovery of the world economy. Chinese capital helped Portugal out of the European debt crisis and the Chinese tourists contributed more to the Portuguese economy, said the Portuguese president, adding that his country was open to Chinese investment and cooperation with China, and welcomed Chinese enterprises to increase their investment in various areas, especially in strategic industries such as finance, energy, transportation, port construction, and electric vehicles. In recent years, plenty of Chinese companies have eyed successful investment in Portugal, such as State Grid Corporation of China, ZTE, Huawei, Fosun Group, China Development Bank, Bank of China, Haitong Securities. Chinese companies have invested a total of 10 billion euros in Portugal. The European Union (EU) remains China’s largest trade partner, largest source of technologies and important source of foreign investment, while China is the second largest trade partner of the EU. It conforms to the interests of both to safeguard free trade and multilateral trading mechanism in a world haunted by mounting unilateralism, trade protectionism, and uncertainties. China and the EU are both builders of multilateralism, and advocators of the rule-based system of trade. They are both willing to handle international relations on the basis of mutual respect, and prefect multilateral trading system through consultations, as agreed by European Council President Donald Tusk and European Commission President Jean-Claude Juncker.